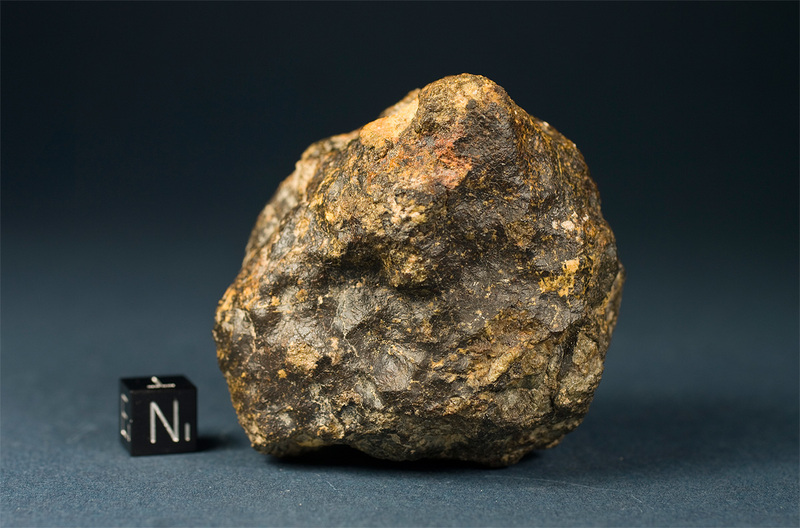 The Dhofar 007 meteorite strewn field was discovered by Russian meteorite prospectors in 1999. More than 27 kg were found within a distribution ellipse 3 km wide and more than 6.5 km long. Due to the untypical texture and color of the slighty weathered eucrites they are hard to spot on the desert surface. The lower image shows the 223 g specimen in situ. The larger part of the meteorite is embedded in the desert pavement with only a small fraction sticking out of the surface. It is a compact irregular ball shaped individual with several regmaglypts and about 50 percent fusion crust.